When U.S. Cavalry troops rode onto the Ute Indian Reservation in northwestern Colorado on September 29, 1879, they triggered a chain of events that cost the Utes their homeland: a deadly battle at Milk Creek, the killing of all men at the Indian agency headed by Nathan Meeker, and the taking of three women and two children who were held hostage for 23 days. The Utes didn’t seek a fight with the whites, most of whom they viewed as friends. However, powerful whites in Colorado wanted the Utes expelled. The Meeker affair was an opportunity to achieve that. 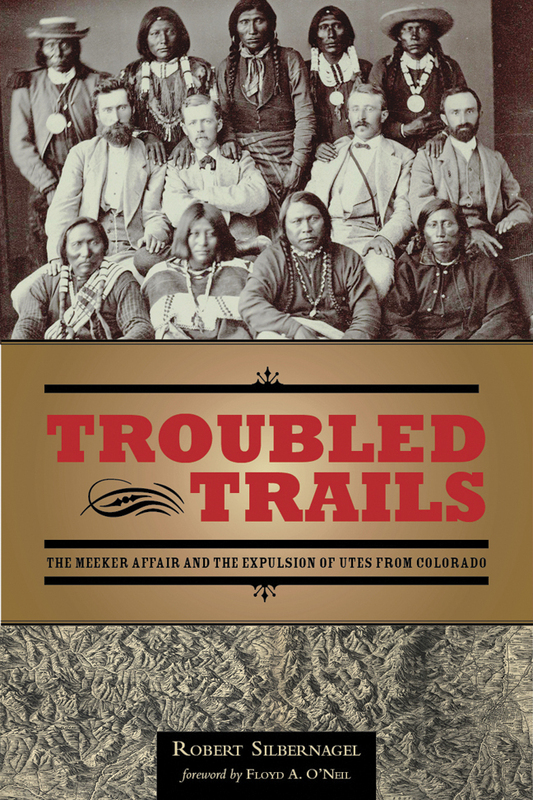 In Troubled Trails, Robert Silbernagel casts new light on the story of the Meeker Affair. Using details from historical interview transcripts and newspaper articles, he reveals the personalities of the major characters—both Indian and non-Indian. He tells the story from many perspectives, including that of Indian Agent Nathan Meeker; the U.S. military; Nicaagat, a leader of the White River Utes; and Josephine Meeker, Nathan Meeker’s daughter, who was held hostage by the Utes. Silbernagel took great pains to tell a complete story, even following on horseback the trail taken by the Utes. As a result, his book paints a multifaceted picture of what took place and, most importantly, his portrayal brings the Ute side of the story into focus. Robert Silbernagel has been writing for Colorado news­papers since 1975. He is currently editorial page editor at The Daily Sentinel in Grand Junction and has earned several awards from the Colorado Press Association.